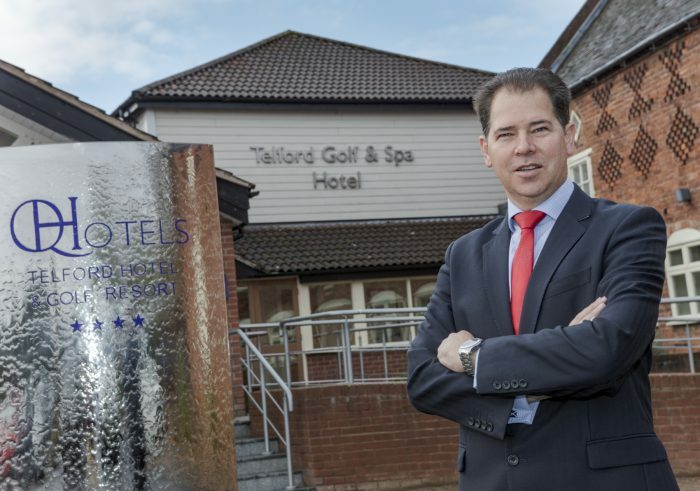 An experienced hotelier has been named as the new general manager of the four-star Telford Hotel & Golf Resort, in Shropshire. Brett Davidge, 45, will head up the 128-strong team at the 114-bed countryside hotel, which is operated by RBH, as part of the QHotels portfolio. Zimbabwe-born Davidge boasts more than 24 years’ experience in the hotel industry, having worked for Red Carnation and Tsogo Sun Group in South Africa, as well as gaining experience at some of the UK’s most reputable properties, including the Gleneagles Hotel and the Dorchester. Following almost four years at Apex City Quay Hotel & Spa, in Dundee, Davidge joined RBH in March in a roving general manager role – and now takes up a permanent post at the spa and golf resort alongside the River Severn. He said: “I’ve enjoyed my time getting to know the RBH portfolio in a roving capacity, but I’m now excited to get started with the team at Telford on a more permanent basis. “The hotel is absolutely stunning, and sits in such a wonderful countryside location. It has an excellent reputation, and it’s my priority to ensure guests continue to enjoy a first-class experience – whether they’re staying with us, playing a round of golf, relaxing in the spa or simply enjoying a coffee and a bite to eat. The Telford Hotel’s picturesque golf course measures 6,741 yards and meanders along tree-lined fairways, through open greens and over strategic water hazards. The course’s signature hole is the eighth, a 382-yard, par-four which requires the drive to be landed to perfection to miss two fairway bunkers, before negotiating a pond with a beautiful mature oak tree … all placed to make the approach shot that little bit more interesting. A great manger, I worked with him at Gleneagles. First class appointment.